Kingston City Council’s Jim Neill urges residents to vote on Princess Street. It had all the trappings of an election. There were lawn signs, TV commercials, and door-to-door campaigners. 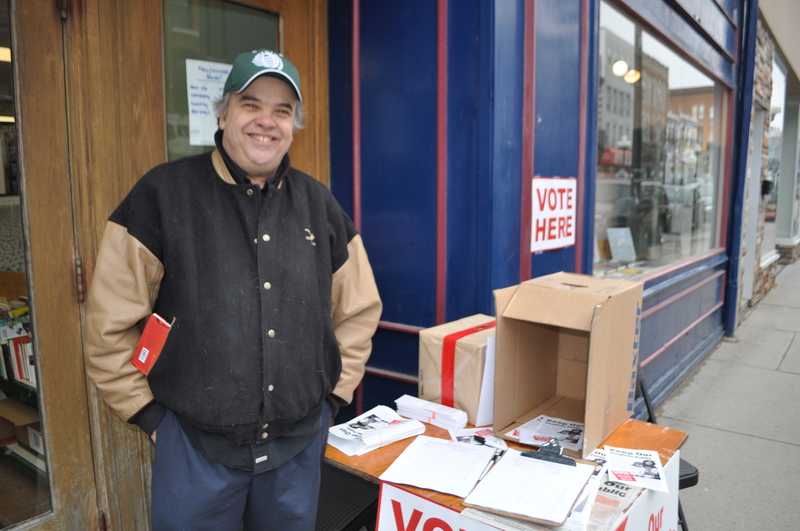 The local media solicited the views of both politicians and citizens as everyone scrambled to become informed before the vote. Saturday Kingston residents got the opportunity to express their preference on whether a proposed new hospital facility in their community was going to be entirely public or be under a 30-year finance and maintenance contract with a private for-profit consortium. While this election wasn’t conducted by Elections Ontario or Elections Canada, it had the feeling of being the real deal. Citizens were given the opportunity by the Ontario Health Coalition to consider a private or public option even if the result will be non-binding. After five weeks of public debate, the answer was clear. 96% of the 9,885 votes cast at more than 50 polling stations said yes to keep the new hospital entirely public. We have had one “official” election on this issue before. In the 2003 provincial election Dalton McGuinty opposed privatizing public infrastructure, campaigning against two “public-private partnership” (P3) hospital deals set up by then Premier Ernie Eves. Like the results in Kingston, in 2003 the public instinctively bridled against the idea of privatizing key elements of Ontario’s public infrastructure. It helped give McGuinty the first of his two back-to-back majorities. Ontarians were already aware of what a bad deal the province got from privatizing Highway 407. They were worried about the impact of deregulation and privatization of electric power, particularly after a devastating outage in August of that year that took out much of the continental northeast. The reality is that hospitals are health care citadels within their communities and attract far more community involvement than some of the so-called private for-profit “community-based” health care providers the government seems to be taken with. Walk into the lobby of any hospital and you’ll likely see an information desk with volunteers from the community sitting behind it. If you’ve had heart surgery recently, you’ll have probably received a visit by a hospital volunteer who is there to answer your questions. Community volunteers are key to making fundraising foundations work for hospitals. Hospitals likely couldn’t function without them. Unlike some of the province-wide private agencies, hospital boards are mostly made up of people who live in the community. They are much closer to the local communities than say the boards of the non-profit St. Elizabeth Healthcare or the for-profit Bayshore Home Health. It is therefore with great interest that we note not all home and community care providers are receiving increases this year despite the government’s rhetoric about shifting services away from hospitals. That’s because some of this work is actually done by hospitals. Now that hospitals are subject to Freedom of Information requests, how accessible will this information really be? It all depends on the hospital and how much money you have. It cost us $1,637.76 to find out what the ratio of staff to management was at 20 hospital corporations. That includes the $5 processing fee it takes to initiate the request. Hospitals came under the Freedom of Information and Protection of Privacy Act on January 1st of this year, although the Ontario Hospital Association sought and received additional exemption from divulging quality information under specific circumstances. For years we have heard front line staff complain that their numbers have dwindled while the ranks of management have increased. 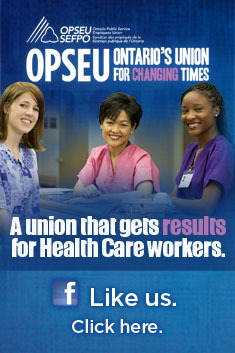 We decided to test that question with requests to 20 randomly selected hospitals where OPSEU represents members. This includes four mental health centres – Penetanguishene’s Waypoint Centre, Whitby’s Ontario Shores, London’s St. Joseph’s Health Centre (Regional Mental Health), and the Royal Ottawa Health Care Group.